Honda’s imminent new Gold Wing is going to be a technical tour-de-force that will herald a new era of development for the company over the coming years. 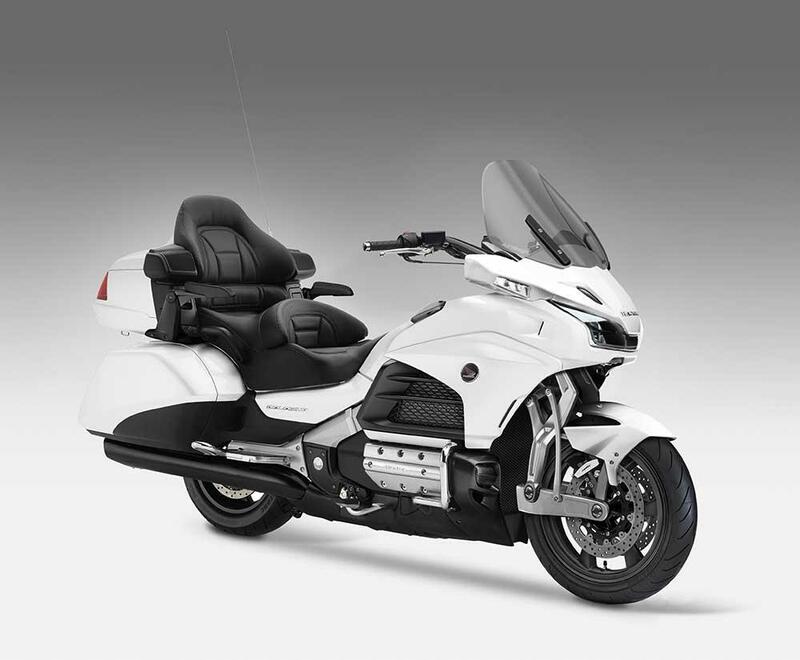 The Gold Wing is a bike that divides opinions like no other, but whether you love or hate the massive tourer it’s become an icon that’s synonymous with technology and two-wheeled luxury. Over the last 15 years the Wing has benefitted from only a handful of updates, while the world around it has changed beyond recognition. When the current incarnation was launched back in 2001, it would have been hard to predict that during its lifespan we’d see an explosion in technology that would result in even fairly mundane machines gaining traction control, switchable engine modes, anti-lock brakes and cruise control. And that’s just the start; technology is the new battlefield for bikes and every year sees new ideas being implemented, whether in the form of variable valve timing, cornering ABS, or semi-active suspension. The Gold Wing, once such a statement for high technology, has been left looking bereft of gadgets in the wake of this revolution. But Honda aren’t going to let their dinosaur slip away into extinction, the Wing will be the catalyst for a new era. MCN caught up with the Gold Wing project leader, Junichi Sakamoto, last week, and while he was not willing to confirm the specific detail of the new Wing he did concede that: “If we were to come out with a new Gold Wing, we would like to surprise people with the amount of new technology.” But insiders have confirmed that a new Gold Wing – something that’s been rumoured for years – is finally nearing completion, and when it’s launched it will aim to leapfrog all those machines that have overtaken it in terms of tech to re-establish itself as the bike to beat. It’s no coincidence that Honda’s engineers have been filing dozens of patents relating to the Gold Wing, and while it’s going to remain instantly recognisable – carrying on the tradition of huge dimensions and a massive flat-six engine – virtually nothing will actually be carried over from the old bike. While there will still be a flat-six-powered Gold Wing in the next generation – virtually every patent relating to the bike incorporates this familiar engine layout – Honda’s engineers have also developed a four-cylinder hybrid alternative.The hybrid version removes the front two cylinders from the engine, leaving a 1200cc flat-four, and in their place puts a large generator unit, bolted straight to the crankshaft. This unit harvests electricity when the engine is on the overrun or the bike is slowing down, storing it in relatively small batteries and then reusing it when it’s needed for acceleration. The overall length of the engine and generator is virtually the same as the normal six-cylinder unit, allowing it to be fitted into the same chassis, and should provide similar performance while offering increases in economy and fuel range. Honda’s dual-clutch, semi-automatic transmissions have been around for nearly a decade now and are a well-proven piece of technology. 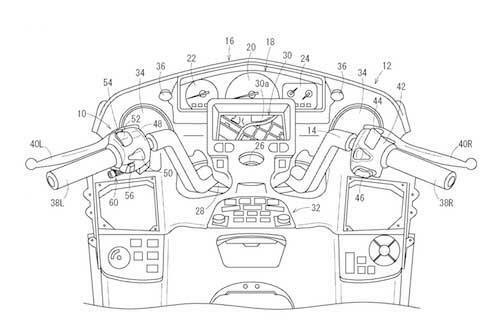 Patents showing just such a system fitted to the Gold Wing first emerged back in 2007 and have continued to appear until the present, with more being filed as recently as last year. The new Wing’s DCT is shown to be much like the ones used in the VFR1200 and NC750, but adds a 7th speed, and a reverse gear. Reverse is via a chain that connects sprockets on the input and output shafts, making them turn in the same direction when the reverse gear is engaged. The 7th gear will aid cruising economy and is another element that could well filter down to other bikes after first appearing on the Wing.While it’s still a manual transmission in its design, the seamless dual-clutch shift and electro-hydraulic actuators mean it can easily be programmed to run in full-automatic mode. For the first time the six-cylinder engine becomes fully structural, acting as the main central section of the chassis. At the front a separate upper frame holds the steering head and the mounting for the front shock and – in this instance – the leading-link front suspension arrangement. Behind the engine there’s a second frame section that acts as a bracket for the swingarm pivot. 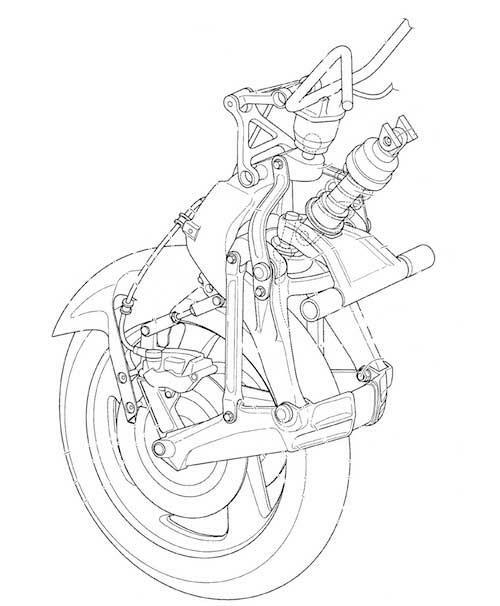 There’s little doubt that the next Gold Wing will ditch the current bike’s conventional fork as the bike’s massive weight and size – as well as the need to accommodate semi-active suspension – pushes Honda towards alternative arrangements.There are two options to replace the fork, both detailed in multiple patents. First is a set-up much like BMW’s Duolever arrangement, itself a take on Norman Hossack’s suspension ideas. It uses a pair of wishbones attached to a cast aluminium girder via bearings that allow it to steer. A single-sprung shock is mounted just under the handlebars, which themselves act on the fork via a simple linkage.The second option is more complicated. It also uses a single shock and a lower wishbone, but there the similarities end. Instead of a fork there’s a vertical member running down from the head tube to just behind the front wheel, and a leading link from the base of this vertical member to the front hub. A linkage connecting the leading link to the front wishbone and shock provides a wide scope for tuning the suspension’s behaviour, including the option of incorporating rising rate into the design. A second link connects the front brake to the vertical part of the suspension, and offers adjustable anti-dive.Whichever option Honda choose, the benefit is that the braking forces are transmitted to the frame via a wishbone that’s much lower than the headstock. This takes the strain away from the headstock area as well as removing the need for a massively rigid fork to withstand the bending forces that come into play when trying to stop such a heavy bike from high speed. Above and beyond its radical engine, hybrid system, transmission, chassis and suspension, the new Wing will be packed with electronics.Patents have already revealed it will have an electric screen for the first time, but that’s just the start. 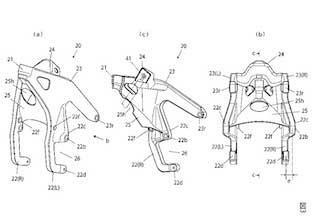 So extreme is the amount of electronic gadgetry on the bike that Honda has filed several patents relating purely to the design of the bar controls, featuring thumb-wheels, joysticks and multiple buttons to give the rider access to all the systems. Sat-nav, stereo, electronic suspension adjustment, not to mention stability control settings, engine modes and possibly even controls for the hybrid system will all need to be accessible and easy to understand.